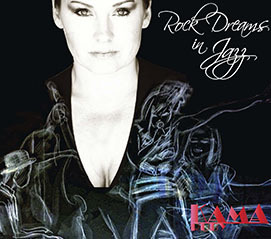 Kama Ruby takes the popular tunes of the seventies and eighties and fuses them into a deliciously blended scrumptious cocktail, guaranteed to delight your senses the intoxicating cocktail has name and its entitled Rock Dreams in Jazz. In particular, her version of “Total Control” made famous by Martha Davis of the 80’s punk rock band The Motels is transformed. Ruby takes this song into her capable hands and gives it a jazz treatment that is worthy of re-invention. Many times when artists attempt to re-arrange a pop-hit, it fails miserably. Ruby’s version is unique and originally executed, making this track a win for the listener. Another worthy cut is her version “Hotel California,” which offers a slinky rhythmic treatment with Latin jazz underpinnings. Kama has a breezy soft vocal style that is alluring and easy going. It is good to see new songs being introduced as potential standards of tomorrow.